창덕궁 후원에 부용지와 부용정, 영화당, 주합루가 있는데 이 중에서 북쪽에 주합루가 위치하고 있다. 주합루 주변은 3단의 화계(花階)에 정원을 꾸며 놓았으며, 화계 첫 단에는 어수문(魚水門)을 두고 주합루에 오를 수 있도록 하였다. 주합루의 정문인 어수문은 임금을 물에, 신하들은 물고기에 비유하여 군신의 융화적 관계를 함축한 뜻이 담겨져 있다. 어수문은 임금이, 그 옆 작은 문(협문)은 신하들이 출입하였다. 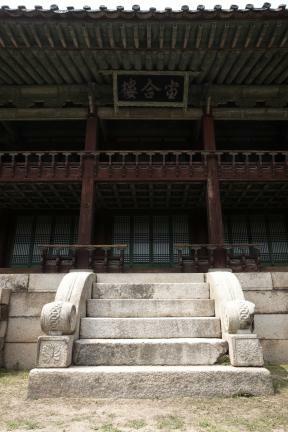 창덕궁 주합루(昌德宮宙合樓)는 정조 즉위년(1776) 창덕궁 후원에 어제·어필을 보관할 목적으로 건립한 2층 건물이다. 기단은 네벌대의 장대석을 바른층 쌓기하고 맨 위의 갑석에는 쇠시리를 넣어 마무리하였다. 건물은 정면 5칸, 측면 4칸의 2층 건물로 기둥은 모두 상하층 통주로 사용하였고, 사방을 외부 기둥에서 1칸씩 물려서 퇴를 두었으며, 내부는 정면 3칸, 측면 2칸으로 구성하였다. 공포는 궁궐에서 전형적으로 사용되는 이익공으로 주두와 익공살미, 행공이 짜여지고 그 위에 재주두가 놓이며 운공으로 장식되어 있으며, 처마는 부연을 둔 겹처마이고, 지붕은 팔작지붕이다. 용마루와 내림마루는 양성바름으로 마감하였고 용마루 끝에는 취두를, 내림마루에는 용두를, 추녀마루에는 잡상과 용두를 얹어 권위가 높은 건물임을 나타내고 있다. 정조의 정책개발과 개혁정치, 조선 중기 문예부흥의 산실로서 정약용과 박제가, 유득공, 이덕무 등 다양한 인재들이 활동하던 중요한 공간이며, 정조가 지은 어제와 어필, 어진, 인장 등을 보관하였던 장소로 그 원형이 잘 남아있어 역사적 가치가 높다. 또한 건물은 경사진 높은 지형에 배치하여 자연과 조화를 이루도록 하였으며, 1층은 왕실도서 보관에 적절한 퇴와 사분합 들문을 설치하였고 내부는 온돌을 두었다. 2층 열람실은 사방의 빼어난 경관을 조망할 수 있도록 배치하는 등 건물의 기능에 맞는 실 배분이 충실히 반영되었다. 이처럼 주합루는 역사적, 건축사적 가치가 높다. 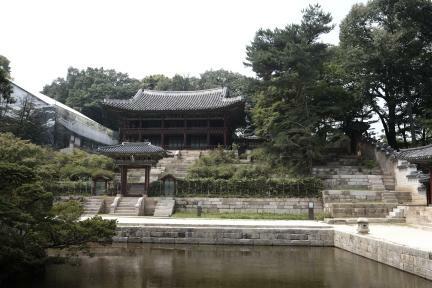 Juhamnu Pavilion is one of the three palace pavilions built around Buyongji Pond in the rear garden of Changdeokgung Palace, the other two being Buyongjeong and Yeonghwadang. 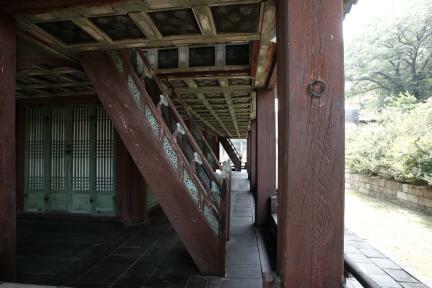 Around the pavilion is a three-tier flower garden through which Eosumun Gate leads to the pavilion. 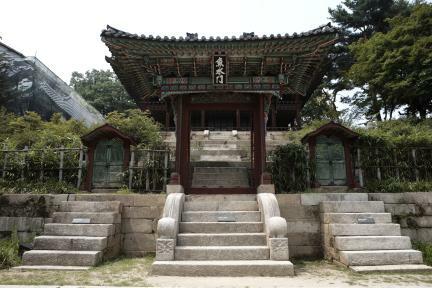 The name ‘Eosumun’ (meaning ‘Fish-Water Gate’) of the main entrance to Juhamnu refers to the harmonious relationship between the king (i.e. water) and his ministers (i.e. fish). The king used the main entrance whenever he visited Juhamnu, while his ministers were obliged to use the smaller archways at the side. 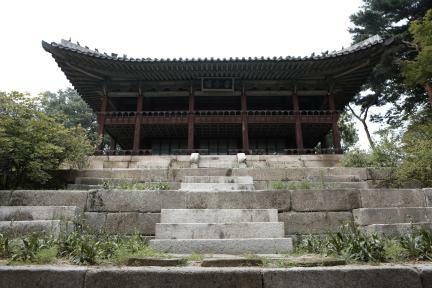 Juhamnu Pavilion in Changdeokgung Palace is a two-story building built in the palace’s rear garden as a storage facility for the writings produced by the king. 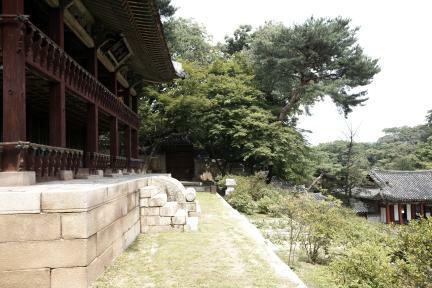 The base is a four-tier structure made by piling up rectangular stones in regular courses and covering them with stones. 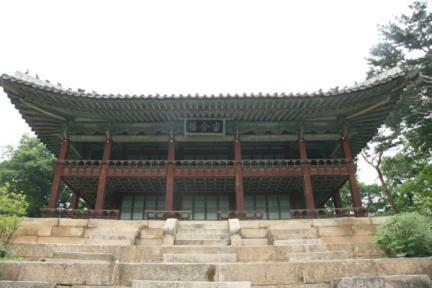 The main building features a two-story structure measuring five kan (a unit of measurement referring to the distance between two columns) at the front and four kan at the sides, single-block columns, and narrow verandas on all four sides. 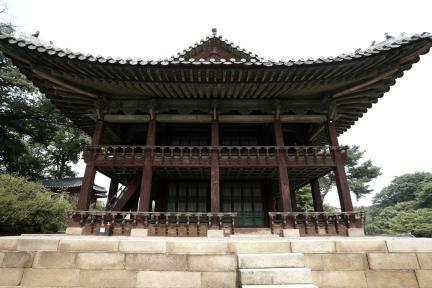 The building is also marked by the use of double-winged brackets combined with other elements that designed to ornament the space between the column heads and the eaves while supporting the roof structures, double-layer eaves, and hipped-and-gabled roof. 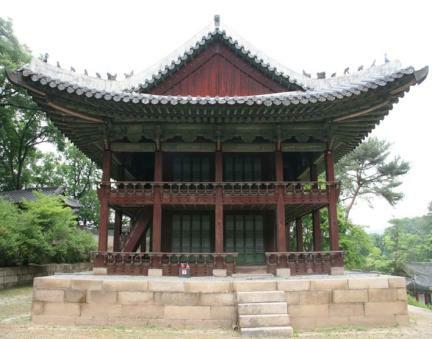 The ridge and rakes are finished with lime plaster, and there are ornamental “eagle heads” on the ridge, “dragon heads” on the rakes, and “miscellaneous figurines” on the hip ridges. 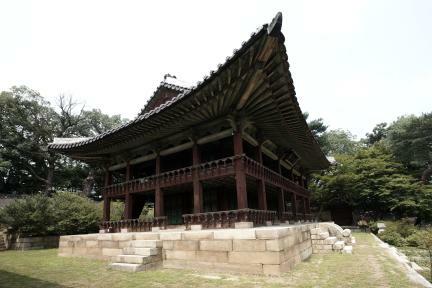 The pavilion is generally regarded as the main stage of King Jeongjo’s political reforms and the cultural renaissance of Joseon, and as the place where his distinguished scholar-statesmen, including Jeong Yak-yong, Park Je-ga, Yu Deuk-gong, and Yi Deok-mu, worked together to develop state policies and where the king’s own writings, paintings, calligraphic works and seals were stored. 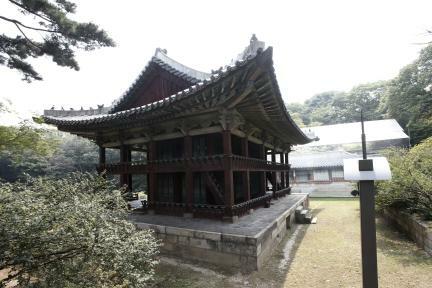 The building, which maintains its original condition, is located on the upper part of a slope in harmony with the surroundings, and has a verandah, four-panel folding doors, and a traditional floor-heating system. 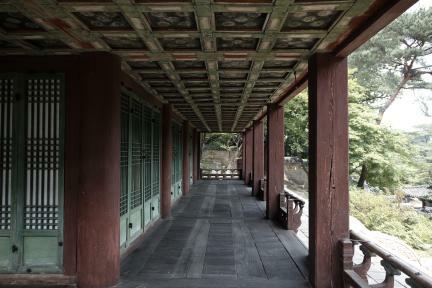 The lower story is perfectly designed to serve its function as a royal library, the upper story for observation of the natural beauty surrounding it.